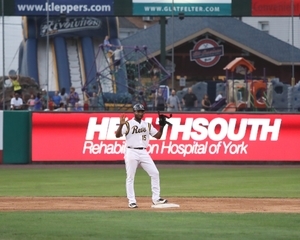 (August 8, 2018) -- The York Revolution couldn’t overcome an eight-run first inning for the New Britain Bees and dropped the rubber match of the series 11-0 in a rain-shortened game on Wednesday night at PeoplesBank Park. The Revs fall to 45-46 on the season and 13-15 in the second half. The Bees broke the game open right away in the top of the first off Revs starter Dominic Severino. Darren Ford led off the game with a double to the left field corner and Brock Stassi followed with an RBI triple off the wall in right to make it 1-0. After two more runs came in on RBI singles from Jovan Rosa and Jamar Walton, Vinny Siena hit a three-run home run over the Arch Nemesis. James Skelton followed with a solo homer to right to go back-to-back with Siena to make it 7-0. The Bees got one more run on Stassi’s RBI double off Revs reliever Jailen Peguero, extending the Bees lead to 8-0 after the top of the first. Severino (4-8) lasted just one-third of an inning, allowing seven runs on six hits. Peguero kept the Bees lead where it was after the first, eating up a season-high four and two-thirds innings on the night. Estarlin Arias followed Peguero with a scoreless sixth inning and James Pugliese logged a scoreless seventh. Meanwhile, the Revs couldn’t figure out Bees starter Andy Van Hekken (5-6). The 39-year-old lefty kept the Revs off balance from the start and allowed just four hits in seven shutout innings with five strikeouts and no walks. The Bees got three more runs in the eighth off Mike McGee to push their commanding lead to 11-0. After Ryan Dent popped out leading off the bottom of the eighth, rain and lightning came and forced the tarp to be put on the field. The game was called official after eight innings, ending in the Revs’ fifth shutout loss of the season. Up Next: The Revs head to Long Island for a four-game series with the Ducks starting on Thursday. RHP Mitch Atkins (8-4, 4.04) will get the ball for the Revs against Ducks’ RHP John Brownell (8-8, 4.03). First pitch is scheduled for 6:35 p.m. Listen to Darrell Henry on the call on SportsRadio 1350 WOYK, woyk1350.com, The New WOYK app, and WOYK 1350 on YouTube with the pregame show starting at 6:15 p.m.